This is no Hail Mary. This. Is. Play Maker! Play Maker - All In One Polish & Protectant (infused w/Bead Maker) features micro abrasive technology that removes swirl marks, light scratches, paint imperfections and mild oxidation producing a bright paint finish. 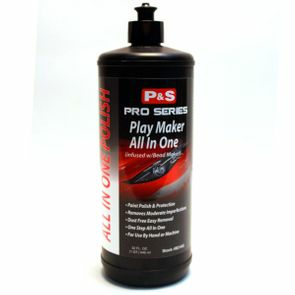 In one step Play Maker polishes and protects paint. Play Maker is formulated to work by hand or rotary, dual or forced action machines. Play Maker is a dust free extremely easy to use product for use by both professionals and enthusiasts. Whether you are a pro or enthusiast you will thoroughly enjoy using Play Maker. Play Maker features a long working time which allows for extended paint correction. The dust free formula also adds to the overall product experience. Wash the entire vehicle prior to beginning the polishing process. If necessary, clay the surface of the paint. Select your desired tool and pad combination for polishing. Take your time and repeat the process over the entire paint surface. Inspect paint thoroughly to make sure optimal results have been achieved and polish to a bright finish using a quality microfiber towel.